Hardwood floors are a reflection of your taste and personality, just the style and color of clothes that you prefer to wear. If the color of your stained hardwood floor is not the shade you prefer, the floor can be restained. How much lighter or darker your choice of stain color is determines the type and degree of preparation work necessary. Stain is the first item applied to a new hardwood floor after its initial installation and preparation sanding. Hardwood flooring then has several coats of finish applied. These coats of finish prevent you from simply wiping on a different color of stain; the stain won't penetrate the polyurethane finish You can achieve a slight change in the tones of the floor’s finish, however, by screening the floor finish and applying a coat of polyurethane with stain pigments mixed in. Check the compatibility of the pigments before mixing them in polyurethane, though. The flooring needs at least one coat of clear polyurethane on top of the stain/polyurethane coat. This works best for creating a slightly darker tone on hardwood A total change of stain color entails sanding the hardwood floor down to bare wood. Sanding removes a layer of the wood and creates a lot of dust. Depending upon its original thickness, hardwood can be sanded at least two or three times before the sander exposes the fasteners holding the hardwood to the subfloor. When fasteners are exposed by sanding, removal and replacement of the flooring is the only option. 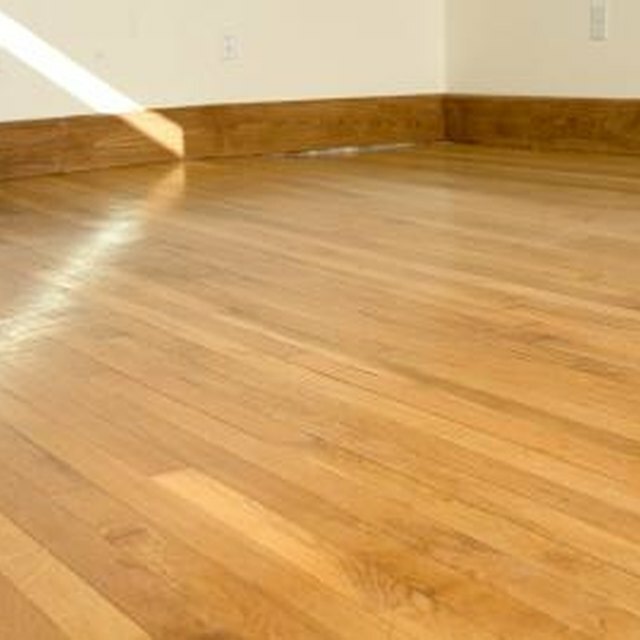 Screening roughens the polyurethane top coat on hardwood, ensuring the adhesion of new finish. Progressively finer screens used on a floor polisher prepare the floor for re-coating. This process does not create a significant amount of dust and does not gouge or scar the surface of the hardwood. This is the best process to use if you want to make slight changes in the finish's color tones Floor polishers used to screen hardwood are less complex to operate than sanding machines Sanders are heavy, and time is required to get the knack of operating them. Improper use of a sander will leave swirls and gouges that are difficult to correct. If your plan is to make a significant change in the stain color of your hardwood, sanding is the only option. If a penetrating oil stain was applied to the hardwood originally, though, a significant amount of the hardwood will have to be sanded off to expose bare wood. RemodelOrMove.com: How Will Hardwood Floor Screening Save Money?